Blogging about literature, films and other things I enjoy. Sometimes, when reading a new book, you’re just hooked from the start and can’t put it down. 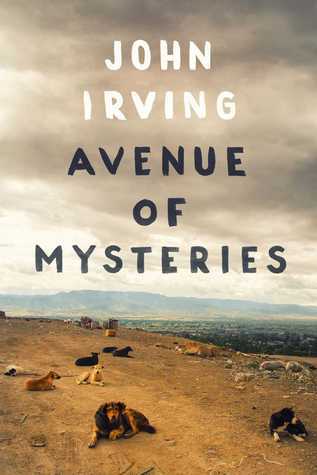 That’s not the experience I had with Avenue of Mysteries by John Irving, but I still ended up absolutely loving it. It did take me quite a while to really get into the story and feel “comfortable” with the characters and and the writing style, but once I was there, in the zone so to speak, I was so engaged. Avenue of Mysteries is set around Juan Diego, a “dump kid” from Mexico and the people around him. We follow him as a kid in Mexico, and as grown up and middle-aged, traveling to the Philippines. As a young boy we see him with his sister living as dump kids, with a range of interesting characters surrounding them, including their father-like figure; the dump boss, the loving and caring catholic priest who whips himself, the transvestite prostitute who becomes a dear friend, and even the Virgin Mary and the Virgin of Guadalupe play vital parts. The adult Juan Diego is a writer, visiting one of his former students, whom he both loves and hates spending time with, while also meeting two mysterious women on his travel. The transitions between young and adult Juan Diego are very fluent and there is a lot of back-and-forth throughout the story, almost like a dream where you are never quite sure where you are. A very clever writing choice, as dreams play an important part in this novel. Juan Diego is often transferred back to his childhood in his dreams, but as a child there is also a lot of talk about the future. In a way, even when we are with him in his present moment there is always something dream-like about his surrounding. In Avenue of Mysteries there is a constant fluidity between realism and mysticism, which can make us doubt what is really happening, and how trustworthy is Juan Diego actually as a narrator? One of Irving’s strongest qualities as a writer in my opinion has always been his characters. In this novel the most interesting character by far is Lupe, Juan Diego’s sister, who is in my opinion almost as much as a main character as he is, though not the narrator. She is the one sets the wheels in motion for pretty much everything that happens of importance, and shapes the characters around her. Being a mind-reader, yet only talking in a tongue Juan Diego can understand, she understandably makes people around her a bit uncomfortable, and perhaps the reader as well. Encountering Lupe’s straight out magical abilities in an other-wise realistic world sets the tone for what sort of story this is. Perhaps this is an example of why I personally needed some time to get into the story, my brain needed to adjust to what I was reading, as it doesn’t fit straight in with what most people would expect. But back to Lupe: A young girl with mind-reading abilities and the gift of sensing future events, who speaks a completely nonsense language. She hates the Virgin Mary and what she represents, is very hot-heated and tends to go on babbling for ages about what upsets her, crying out completely inappropriate things for a little girl. What’s not to love? She is also a very sad character though, being so exposed all the time to everyone’s private thoughts in a very grown-up world, and being too young to fully understand them, she mostly interprets them perhaps worse than they really are, which of course has a big effect on her as a person. As you understand, I truly loved Avenue of Mysteries, but that is not to say it is without flaws. The “danger” of having two main timelines in a story is that the reader usually will end up with a strong favourite, in my case the young Juan Diego’s story, so even though I enjoyed reading everything, I often found myself hoping we’d soon go back to my favourite storyline. The book is also just a tad too long in my opinion, some passages and chapters could have been shortened somewhere among the 460 pages. But all in all, a very good book that I recommend strongly. 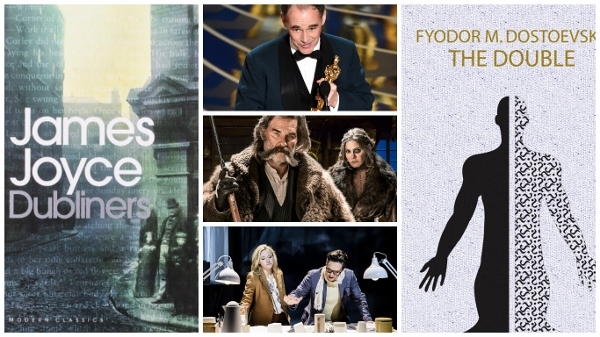 Books read, movies watched, songs listened to and cultural happenings attended in January and February 2016. Click on the links to see the respective blog posts about the experience. I’ve watched A LOT of films these two months to prepare for the Oscars, and of course keeping up with my general “film education”. I managed to see all the Best Picture nominees, and almost all the other big categories except for Joy and Creed. There were quite a lot of strong nominees in all categories this year, and I’m really happy with most of the awards. Spotlight for best picture was well deserved, and I’m of course very glad for Leonardo DiCaprio. One of the best surprises was Ex Machina winning for visual effects and Mark Rylance for Supporting Actor. A brilliant film and a brilliant actor! It’s no secret that I quite disliked The Big Short, and would have liked to see another film take home Best Adapted Screenplay, like for instance Carol. But all in all, happy with the ceremony! Here’s to another two good months with many good things to explore! I received this beautiful edition of Frankenstein (same one as pictured) from my boyfriend this Christmas, and finally started reading it at the start of February. 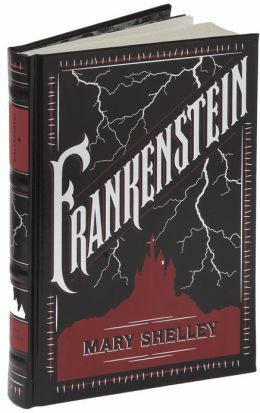 I had never read Frankenstein before, but as most people I felt I was quite familiar with the story, having been exposed to its numerous adaptations through the years. Therefore I started reading with quite a lot of prejudice: I was looking forward to it because it’s such a classic, but at the same time my expectations weren’t that of a superb literary work. For some reason I didn’t want to get my hopes up about it being more than a “mediocre horror novel created to shock people in its time”. I’m so glad to say that I was completely wrong. First of all, Frankenstein is beautifully written, and though it has inspired many mediocre adaptations and other works (but also good ones of course) it is itself anything but mediocre. Mary Shelley really knew how to write, and she was only between the age of 18-20 when she wrote what would be her most famous work. The language is truly beautiful, with a lot of emphasis of describing the natural beauties in the world and humans, which contrasts much of the ugliness that later takes place in the story. 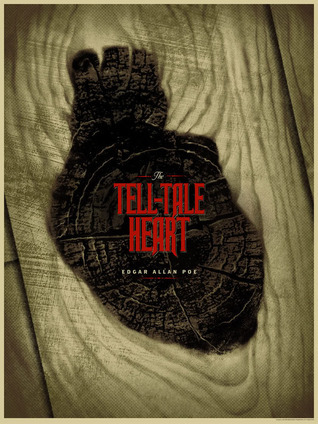 With a mix of chapters in letter-form (framing the story at start and end) and characters telling each other what they know in retrospective, it might not be truly realistic (who remembers and speaks about all these details when telling someone else a story? ), but in the context of the time one has to accept that this was a normal method of story-telling, and it didn’t bother me one bit. 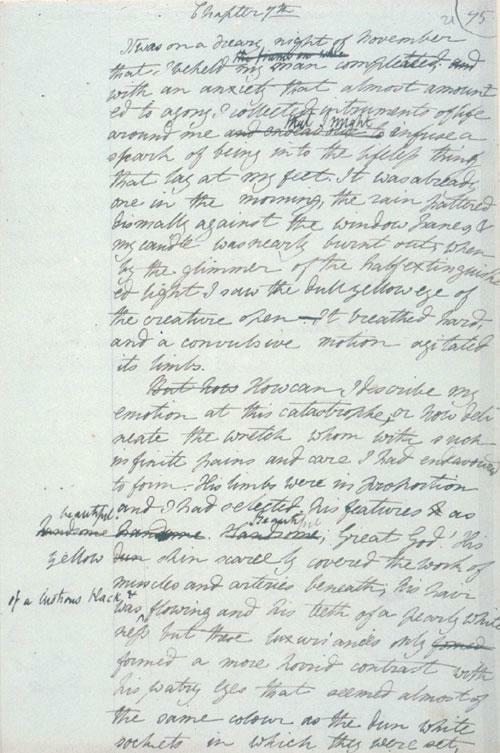 I’ve read quite a few reviews that had issues with Shelley’s writing, particularly with how she described character’s thoughts of each other, with the critique being that “it’s clear a man wouldn’t think about, or describe another man in such loving affections and tenderness”. Well, this novel is from 1818, and having read many other works created in the 18th and 19th century, I’ve found this to be the norm among most writers of the time, and not something that was considered a feminine perspective. The affectionate descriptions are also keeping in touch with the elements of romanticism that can be found in Frankenstein; celebrating nature and beauty, also within man. There’s a great contrast in how the novel clearly celebrates the wonder of man and the humanly virtues, yet also reveals the potential horror in what we create and our evils within. There has always been a debate on whether Frankenstein is mainly a horror story or science fiction, but I don’t see any reason why the two genres can’t be combined equally. The horror elements are certainly very present, and if Wikipedia is to believed, Mary Shelley originally wrote the story as a result of a bet about who could write the scariest horror story. Some people have complained about it not being scary enough to classify as a true horror story, where I would respectfully disagree. It may not be the type of story that leaves you afraid of the dark and afraid to look around the corner, but it has a creepiness present throughout its whole course, and it’s an original take on “what is the true horror”. That’s at least my interpretation, by reading Shelley’s work we are made to reflect who are the true monsters of the story and what creates hate? The truly scary part is that most people would agree that it is us, ordinary and well-meaning human beings that are responsible, and that we can see ourselves acting exactly the way the people in Frankenstein do, leading to the same horrible consequences. That is not to say that the monster itself is not scary, or perhaps more correctly: it’s understandable how it was perceived as such as the time. Imagine Europe in the early 19th century and the changes it was going through, the natural sciences was rapidly making progress, the world was evolving insanely fast compared to previous years and it would have seemed like mankind would be able to do just about everything we could desire. It’s no wonder a horror story about a scientist using the natural sciences to create life and then facing horrendous consequences was considered absolutely nerve-wrecking! But anyhow, though the monster might make people afraid of him, there’s no question about how the true horror originates from Victor Frankenstein and people like ourselves. The monster is in fact a child, super strong, quick and abnormally big, but still fundamentally a child. He wakes up with no knowledge about the world, the people in it or himself, and is shunned from his creator (or parent one might say) from his very first living seconds. He starts as a completely blank page and soaks up everything around him, being influenced and learning everything by observing and eventually interacting, exactly the same as everyone else who are new to the world. My love for Steinbeck continues to grow, and now that I’ve at last read Grapes of Wrath I can finally call myself a true fan of his. Often considered his greatest work, and which he won the Pulitzer Prize for, it truly is one of the great American novels, and after reading it I understand and approve of all the recognition and praise it has gotten over the years, but also the controversy it has stirred. And it sure has stirred up quite a lot. 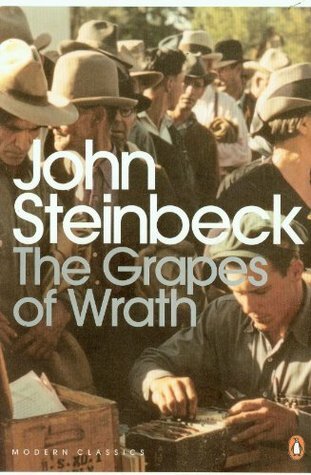 Steinbeck does not go easy on those he hold responsible for the migrant worker’s hardships during the Great Depression, he is angry and Grapes of Wrath is thus an angry novel. It points fingers, it lays blame, and it is never doubted whose side we should be on in this conflict. In someways it is therefore understandable how certain people were put off, Steinbeck’s presentation of the time is not neutral, but it sure is passionate. Reactions to to his work varied greatly, it received praise from the critics, won prizes and spent ages on top of the best-seller lists, but it was also banned by school boards and libraries, condemned by right-wing ministers, corporate farmers and politicians, who claimed the work and the author to be communist, immoral and untruthful (DeMott, 2000, p. xxxviii). Exactly the same people who Steinbeck can be said to attack in Grapes of Wrath. Nonetheless, people kept buying the book, and are still doing so to this day. When looking at the book purely as a work of literature and not as a political instrument, it has been greeted warmly, and received mostly great reviews upon publication, although some critics have criticized Steinbeck for being too sentimental in his writing, and questioning his writing style. I personally find the book extremely well written, and the style suited for the people he represent. Steinbeck very much writes in the “voice” of his characters, which are the migrant workers: not necessarily the most educated, but hard working and resourceful people. It is only natural that should be reflected in the language used. I have to admit though, as a Norwegian reader it’s hard at times to understand some of the most local and old fashioned phrases and word choices, which is one of the reasons The Grapes of Wrath took me a while to finish, but I would never even consider reading this in a translated version. The style of the language is such a crucial element to the work, and makes you connect even more the characters and setting. 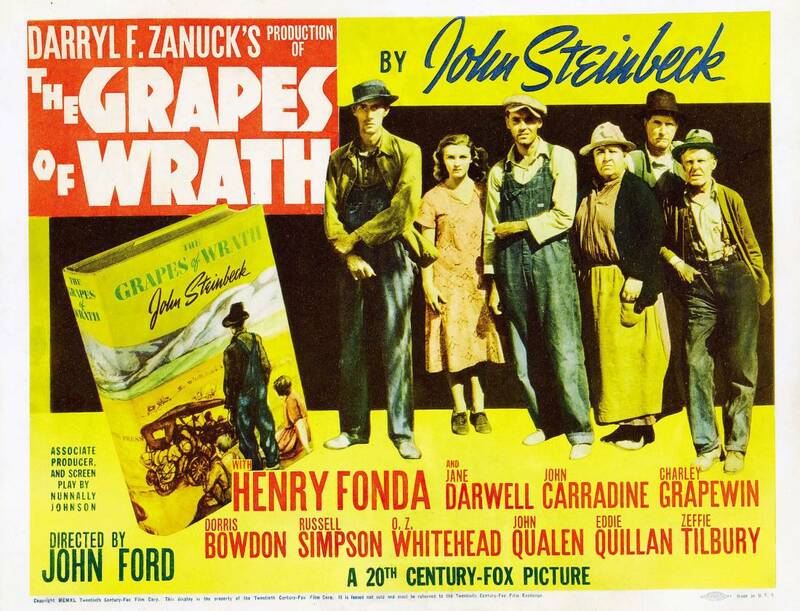 An example of “The Grapes of Wrath’s” success: The book was quickly made into a film, already in 1940 John Ford’s directed motion picture was released, starring Henry Fonda. It was instantly a hit. Another interesting aspect of The Grapes of Wrath’s style is how the chapters are composed. The book presents the family Joad’s story, but in (almost) every other chapter the perspective changes and presents us with a more general view; here we read about the state of the country, the migrant farmers as a whole, see symbolic happenings taking place and similar. DeMott describes the technique as “one which combined a suitably elastic form and elevated style to express the far-reaching tragedy of the migrant drama” and “a contrapuntal structure, which alternates short lyrical chapters of exposition and background pertinent to the migrants as a group with the long narrative chapters of the Joad family’s dramatic exodus to California” (2000, p. xii). I found this technique to have a brilliant effect, by including the general chapters we truly understand the magnitude of what was going on, it has a greater impact than just one family in a book, and then we are guided back to the Joads which we emotionally connect to and give those we learn about a human voice. The use of this technique also shows that in addition to writing a book about something he was deeply passionate about and that he felt needed to be said, Steinbeck was also experimenting as an author, which is always the sign of a great writer. Reading The Grapes of Wrath took me all of five weeks, but I’m so glad I took the time. In my opinion it is one of those books everyone should read at some point, and it has made me an ever greater Steinbeck fan than I already was. It quickly made it’s way in to my “favourites”-list on Goodreads, among with East of Eden and Of Mice and Men. As a finish, I’d also like to recommend the John Ford film from 1940, made only a year after the book was published. It’s an excellent adaptation, and mostly true to it’s source material, with some great acting by Henry Fonda. DeMott, Robert (2000). “Introduction” in John Steinbeck, Grapes of Wrath (p. ix-xl): Penguin Classics. Steinbeck’s East of Eden – A new favourite! Okey, so.. ages since my last post. Let’s just ignore that! 2016 is here! Alright, 2016 was here 19 days ago, but it’s still January, so I feel I can justify making a “what was 2015 like”-blog post. Starting off with books read in 2015! I thought I’d also make a similar list concerning films I’ve watched the last, which will be up this week as well. I think two authors really defined my book year of 2015: John Steinbeck and Norwegian author Jon Michelet with his currently four books in the series A Hero of the Sea (title translated freely by me, En sjøens helt in Norwegian). Michelet’s story revolves around the Norwegian war sailors, concerning both cargo and military ships. Unfortunately they have not been translated to English (yet? ), so you’d have to be able to understand Norwegian to read them. Steinbeck is, among Michelet, my most read author this year, with 4 titles. As I’ve read more of his works he has become one of my favourite writers, and I actually started 2016 by reading one of his greatest works, Grapes of Wrath. One of his works actually became the topic for one of my semester assignments; The Moon is Down from 1942. Always fun when you can write about something you like for school! Most disappointing: Funny Girl – Nick Hornby and Hotel on the Corner of Bitter and Sweet by Jamie Ford. New Favourites: The Old Man and the Sea – Ernest Hemingway, East of Eden – John Steinbeck, The Short History of Nearly Everything – Bill Bryson and Apology by Plato. Best non-fiction: The Short History of Nearly Everything – Bill Bryson and Apology – Plato. Best Children’s Book: Tonje Glimmerdal by Maria Parr. All in all I read 36 books in 2015, not counting rereads of titles I’ve read before. The following is a list of all 36 sorted by reading date, and with the rating I gave it on Goodreads. For the works that only have a Norwegian title I’ve included my own translations. Looking back it’s been quite a varied book year with a lot of highlights, but also a few disappointments. Unfortunately one of the latter was the work of one of my favourite authors; Nick Hornby. Funny Girl turned out to be boring girl.. Sorry Nick, but I’m still looking forward to your next one! Read from October 4th to October 15th. I finished reading American Gods last night around 1:30 AM, the last few chapters made it absolutely impossible to go to sleep. And that’s everything I’m going to say about the ending. I feel like I’m reading this book years after everyone else, and I don’t really know what took me so long. I’d heard a lot of good things, so I bought it a few months back and finally started reading it 11 days ago. For those of you who don’t know anything about the book, I’ll try to explain in a few words: American Gods is an urban fantasy novel, and the story takes place in the modern-day United States. Living among the American people are all the gods brought to the country (through the minds, worshipping and prayers of the people coming to America) over the years, now most of them forgotten. Our protagonist, Shadow, finds himself suddenly involved in this world with the old Gods from ancient worlds and the new, representing the media, drugs and so on. The old god who calls himself Wednesday recruits Shadow to his services for the oncoming storm, the war between the old gods and the new. However, describing what the story is about says very little about what sort of book this actually is. American Gods is quite unlike any other fantasy novel I’ve read, although I have to admit I’ve never explored the urban fantasy genre much. It is of course much more different than Percy Jackson for example, although one can draw similarities between the modern setting and the use of ancient mythology. Do not compare the two in style however, the former is a much more raw and gritty experience, and of course, probably aimed at an older audience. The themes are quite adult and the language at times explicit, describing sexual and violent scenes. And describing them well I dare say. 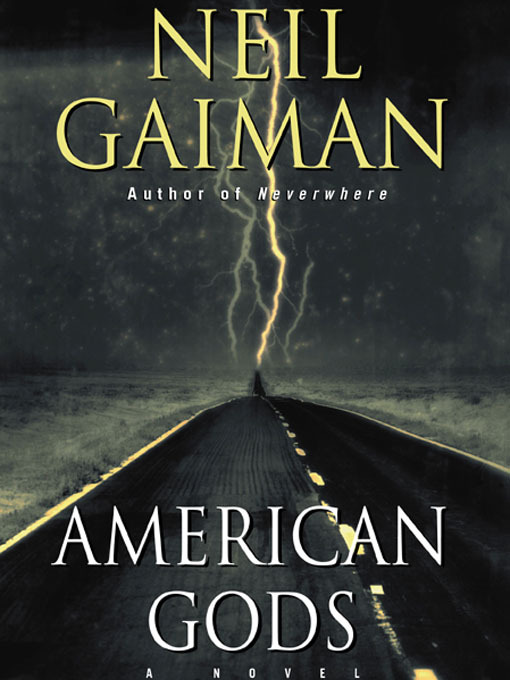 At times American Gods feels like reading a “great American road trip” novel, you have “the boys” riding around, some great descriptions of the country, and the sort of raw and unrefined style of that “traditional macho”(in lack of a better word) genre. You sort of forget that you’re reading what is actually a fantasy novel, but then something extraordinary happens and you’re almost violently reminded. The story itself I found extremely well designed, and the language suits the feel of everything very well, making the characters feel real. The only negative opinion I have regarding the book, is that it just felt a bit too long at times, especially about midway some aspects were just drawn out and could have been cut completely. I did read the author’s preferred text though, which I believe is quite a bit longer than the originally published novel. I can see how Gaiman wanted to include as much as he possibly could to fully flesh out his wonderfully thought of world, but some of it felt just a bit unnecessary. Overall though, American Gods is in my opinion a very good and entertaining read, which I fully recommend. At the end of each month, I’m planning to post a list and a short review of each book I’ve read the last few weeks. As I’m starting this in mid-October I’d thought I’d start off with a belated “monthly reads post” for August and September, combining the two. There are a lot of books left out as a lot of my time was spent reading Norwegian children’s books (for school) or other Norwegian books that haven’t been translated to English yet. Some of these children’s books are however quite interesting for adults as well, so I’d actually like to dedicate a whole individual blog post to the reading of children’s literature. So, lets go ahead and look at the rather short list of my August and September reads! It’s not hard to grasp why this is considered the first “modern detective novel”, it’s quite obvious how this story has inspired a whole bunch of later releases in the genre, especially a certain Conan Doyle. A tribute to the science of deduction and rational thinking, it’s quite interesting, but unfortunately it felt a bit too dated for me to thoroughly enjoy it. The characters are a bit too flat, the plot and solution a little bit too ridiculous, but it’s fun to see where it all began. I received this as a birthday gift from my boyfriend, and it instantly became one of my favourite books of all time! The book is pretty much exactly what the title describes, teaching the reader about the history of science, starting from the very beginning of the universe. Each chapter is dedicated to a different aspect of science, for example geology, chemistry and so on. 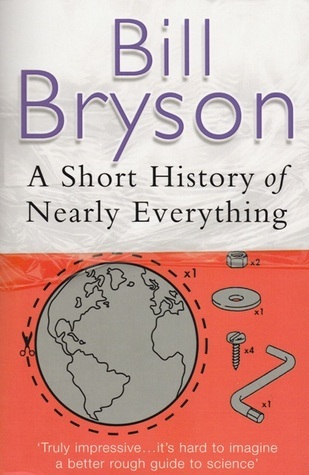 It is no dull science book whatsoever though, Bryson is extremely witty in his writing style and sprinkles lots of interesting and often hilarious trivia throughout, there are evidently a lot of absurd situations in the competitive field of science. At the same time you don’t feel that the subjects are too dumbed-down, Bryson perfectly explains a lot of “unexplainable” things, often using quite creative metaphors, and when you’ve finished reading you’ll have learnt quite a lot about, well, everything! Such an interesting little read. Apology was something I snatched up quite without thinking about it at a book sale, mostly because it was small, cheap and I like Ancient Greece. I sat down and read through it the same day, and was pleasantly surprised by how non-dated it felt reading through it. 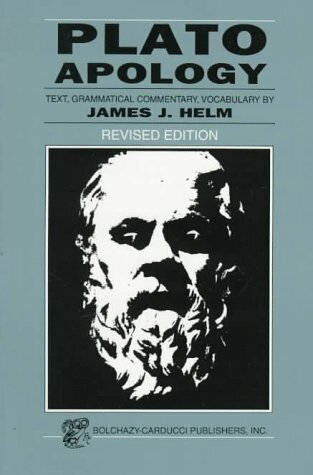 Of course, the translation I was reading was, I’m guessing, quite different than ancient Greek, but even if the language had been entirely different, the subject that was actually talked about felt like reading something from a modern day trial. A recommended read for anyone interested in history, democracy, the old philosophers or who just want to try something a little different. 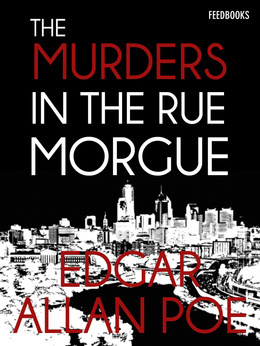 One of the most anticipated books of 2015 for many, myself included. I don’t often find myself reading a lot of what is often called “chick-lit”, it’s just usually not my preferred genre. 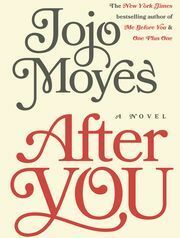 However, Jojo Moyes is truly an exception to this, I really liked Me Before You and I LOVED The One Plus One. Naturally, After You had a lot to live up to, sequels to such a beloved book are always hard. Luckily, I think Moyes found the perfect way to continue the story of Lou Clark in a way that feels natural, and I ended up adoring After You as well. It’s not AS intensely stirring as Me Before You, but it contains the same beautiful and complex characterisation, Moyes is very good at making everyone in her stories feel very real and human. After You will probably make you laugh and cry, and I particularly liked how the ending was resolved, without spoiling anything it makes the story stand out a bit more than others in the same genre. Studying Library- and Information Science.